This is already Venice. After parking your car, you may proceed on foot or embark on public waterborne transportation. Autorimessa Toderini (4 € hour). One of the alternatives is to leave the car in the parking garages of Tronchetto Interparking Italia, which may be reached by turning right at the end of the Ponte della Libertà. The cost is: from the first to the second hour 3 €; from the third to the fifth hour 4 €; from the sixth to 24 hours 21 €. From here, you can take Actv vaporetto line 2 or the People Mover that connects the Tronchetto to Piazzale Roma in only 3 minutes. Departures are every 7 minutes, from 7 am to 11 pm. The fare is 1 euro (at the automatic ticket machine). 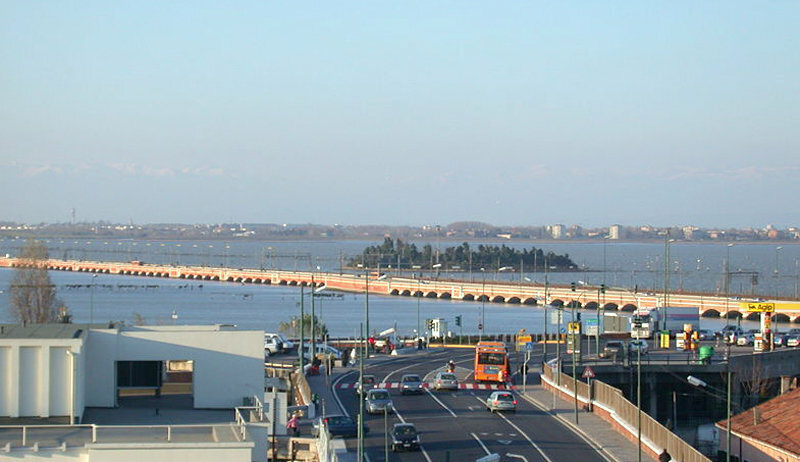 Another possibility is to leave the car on the mainland in Mestre, Marghera, San Giuliano, Fusina, Tessera or Ca’ Noghera, and from there reach Venice by taxi, by bus to Piazzale Roma, by train from the train station in Mestre or Porto Marghera to the Santa Lucia Railway Station in Venice. From the parking area at the Terminal in Fusina, there is a waterbourne transportation line that takes you to Venice, stopping in the Zattere area. The cost of the fare is 8 € one-way ticket, or 13 € return ticket.